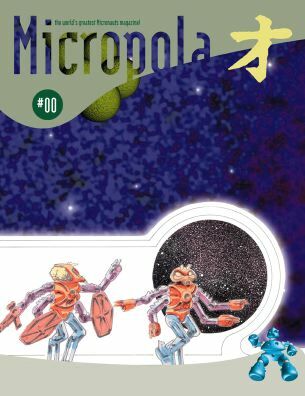 Micropola, the World's Greatest Micronauts Magazine! Above is an image of the cover. The 24 page issue #00 of Micropola is printed digitally in high resolution on quality paper stock. It contains 8 pages of color and 16 pages of black and white. Highlights include an interview with the original designer of the first Micronauts aliens, including a plethora of never-seen-before prototype images and concept sketches, as well as figures and playsets that were never produced! Other highlights include two articles on Steel Geag, explaining his transformation and fighting styles and a great MicroChange/Transformers article that demystifies the connection between the two. Micropola is initially limited to a run of 300 issues. It was made available for the first time at this year's MicroCon 98, which was held in Toledo, Ohio over Labor Day weekend. If you want to be sure you get a copy of this groundbreaking, sure-to-be-a-collectors-item magazine, order now! To order, send an email to: yellowclaw@comcast.net with the subject BUY MICROPOLA. Please note the number of copies you wish to receive and include your name and address. You will be e-mailed a confirmation with payment instructions. The price? $12 plus $4 for postage (I will only be mailing issues via Priority mail). Foreign orders, please contact me first for final price. Payment by Paypal or via check or postal money order only. Please contact me before purchasing, as availability is limited. And don't forget about Micropola #01, the second issue on CD-ROM (Mac and PC compatible, in PDF format). Weighing in at over 300 pages, its packed full of Micronauts, Microman and Henshin Cyborg information! Cost for Micropola #01 is $6, plus $4 for priority air mail shipping in the US.